6 Takeaways From Georgia's 'Use It Or Lose It' Voter Purge Investigation Tens of thousands of Georgians who haven't voted in recent elections may be no longer registered to vote, according to an investigation from APM Reports, Reveal and WABE. Georgia gubernatorial candidates Stacey Abrams and Brian Kemp in Atlanta. The final stretch of the hotly contested Georgia governor's race is being consumed by a bitter political battle over access to the polls. Tens of thousands of Georgians who haven't voted in recent elections may show up at the polls on Nov. 6, only to learn they are no longer registered to vote and cannot cast a ballot. In July 2017, more than half a million people were removed from Georgia's voter rolls. Of those, 107,000 were purged because they had decided not to vote in previous elections and they failed to respond to mailed notices from the state. That's according to an investigation from APM Reports, the podcast and radio show Reveal, and public radio station WABE. Kemp faces Democrat Stacey Abrams in a close race. If Abrams wins, she will be the first female African-American governor in the country. 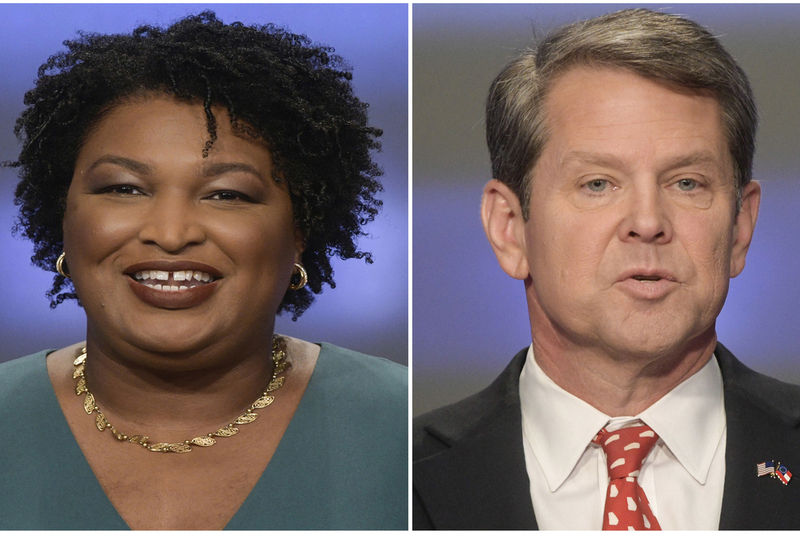 A key aspect of Abrams' strategy to turn Georgia blue is boosting turnout among people of color. Democrats and civil rights groups say these voters tend to show up to the polls less regularly than Republicans, and they say purging rolls for not voting is a suppression tactic the GOP is using to gain an advantage. Kemp denies that and says he has made voting easier by setting up online registration. When it comes to the purges, he says he is just following the law and that he hasn't taken a more aggressive approach to removing voters than previous secretaries of state. But an APM Reports analysis found there has been a big jump in removals under Kemp. Georgia reported removing more than 1.6 million names from the voter rolls in the past decade. The removals have brought attention to a debate over whether voting is a right, pure and simple, or whether it's both a right and a privilege. Here are six highlights of the investigation and other voting controversies that are dominating the race for governor in Georgia. The analysis found 107,000 people were removed from Georgia's voting rolls in 2017 under "use it or lose it." This is the first public estimate of the policy's effect in Georgia. If these voters aren't aware they've been removed from the rolls, and they go to the polls next month, they may not be able to cast a ballot. Under Georgia's policy, voters who went to the polls in 2008, when President Barack Obama ran the first time, but have not voted since could have been removed from the state's voter registration list in 2017. There is general consensus that voters who have moved or died should be removed from the voter registration list. But civil rights groups say the priority should be making sure everyone who wants to vote is able to. Republican leaders, like Kemp for example, put an emphasis on keeping the rolls clean as a means to fighting voter fraud. Kemp says he hasn't been more aggressive than other secretaries of state in removing people from the voter registration list. But, as pointed out, the numbers show a different picture. 3. "Use it or lose it"
At least nine states have a policy like Georgia's where citizens can be removed from the voter registration list for not voting in past elections. The most well-known is Ohio's. In that state, the removal process is triggered for anyone who doesn't vote in a single election. The entire removal process takes six years. Earlier this year, the U.S. Supreme Court ruled Ohio's policy is in line with the National Voter Registration Act. 4. Lawsuits and "voter suppression tactics"
In the last two weeks, four voting rights lawsuits were filed in Georgia. An APM Reports analysis found only Texas has seen more federal voting rights lawsuits filed against state officials since 2011. This year the U.S. Commission on Civil Rights, a federal agency, studied voter suppression tactics including voter ID laws, proof of citizenship requirements, purges, cuts in early voting, and polling place closings. Georgia is the only state once under federal oversight to have adopted all five. Early voting has spiked around the country as Election Day nears. There are concerns over the number of absentee ballots being rejected by Gwinnett County in suburban Atlanta, the only jurisdiction in the state that is federally required to provide ballots in English as well as Spanish. The county has tossed out hundreds of absentee ballots over signatures that don't match or for missing birth dates. Gwinnett officials say the county is following the law. A pair of federal lawsuits will be in court on Tuesday. Georgia has a controversial policy of flagging voter registration applications that don't exactly match other government databases. A registration can be halted, even if one letter is missing. The policy disproportionately affects applications from people of color. These people can still vote if they take a photo ID to the polls, but civil rights activists worry this will create confusion and discourage people from voting. Tens of thousands of applications are on hold. Some of them clearly appear to be erroneous, like those that include the name "Jesus Christ." Kemp's campaign has called recent criticism of the policy a manufactured crisis meant to energize the Democratic base.